After the tour through the MASH Unit, you will be taken to the recruitment tent where you will be persuaded to volunteer to join forces with our military to help fight the Zombies inside the brewery. General Peter Litsky from the Zombie Outbreak Command will size you up to see if you have what it takes to go to Zombie Boot Camp. 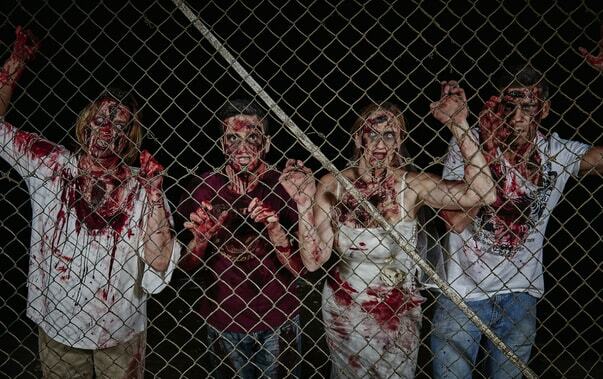 If you accept the challenge, gather your strength and get the equipment you need to move onto Zombie Basic Training. The Zombie Maze is a haunted zombie training simulation that will test your agility, problem solving, and leadership skills. You and your squadron will have to work your way out… without getting infected. The next steps in your journey are not for everyone. You need to take a deep look inside yourself to see if you have what it takes to fight the fight to stop the outbreak from spreading. May God be with you in your journey.